Consumer Staples was the best sector over the past 30 days followed by Technology. Defensive sectors are underperforming since November. Industrials, Technology and Financials are showing relative strengths. Over the past one month, SPDR S&P 500, SPY, gained +3.47%. The leading S&P 500 sector over this period was Consumer Staples. Its sector ETF, XLP, outperformed SPY by +1.58% (Figure 1). The next best sector was Technology, XLK, which out gained SPY by +1.02%. The worst performing sector was Energy, XLE, which declined by -1.36%, effectively returning -4.82% less than SPY. 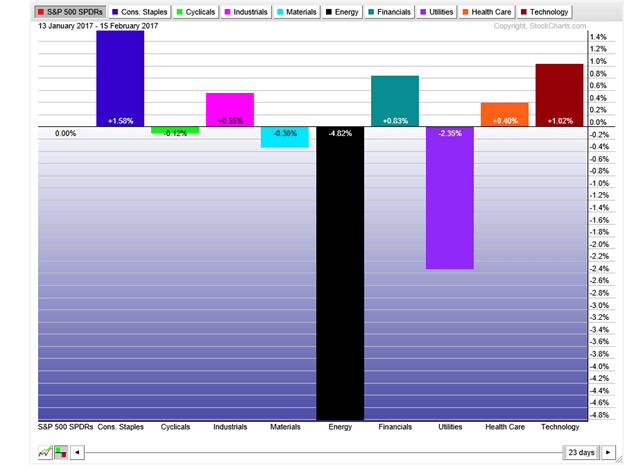 The second worst sector was Utilities, XLU, which, although, positive for the period, returned -2.35% less than SPY. SPY entered into a horizontal trading box in early April 2014. It first exited the box to the upside in July 2016, then briefly fell back within box before leaving it again in November 2016 (Chart 1). The lower bound of the box is near 181 and the upper limit is near 213, giving us a height of approximately 32 points. The 61.8% extension target of the trading box is 232.78, which was achieved on February 14. The 100% extension target is near 245.00, which is 4.3% away from the closing price of 234.92 on February 14. On daily timeframe, SPY made a symmetric triangle in December and January (Chart 2). The high of the triangle is 228.34, reached on December 13 and the low is 222.73, made on December 30. On February 2, SPY exited the triangle to the upside in second attempt. The 100% extension target of pattern is near 232.43 and 161.8% extension target is near 235.90. SPY reached both of these target level. 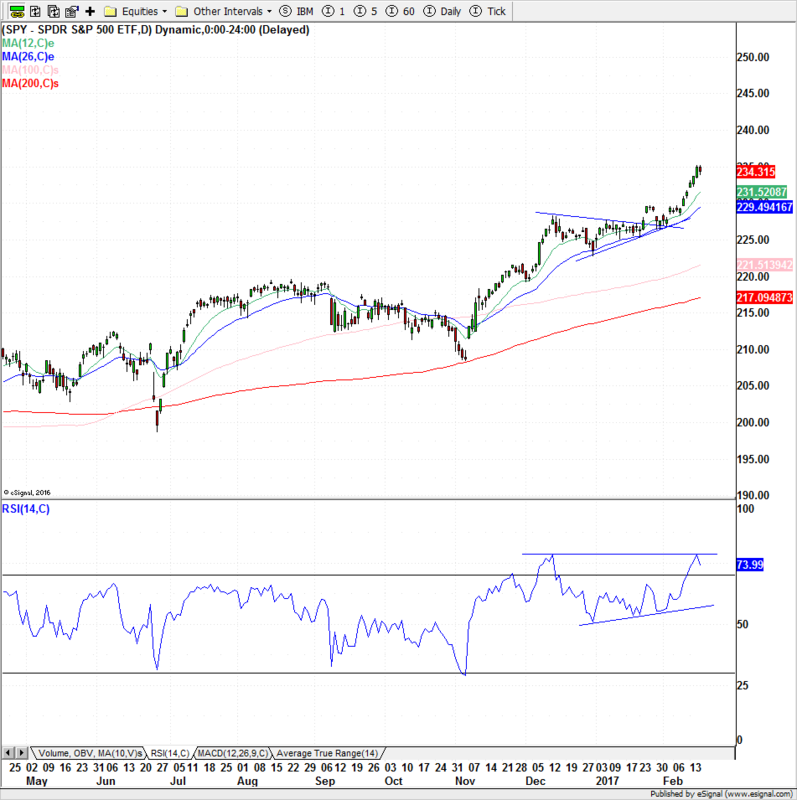 The 14-day RSI of SPY is making a double top pattern – high readings on December 13 and February 15. It is not showing divergence but this still calls for caution in the near future. Relative to SPY, the defensive sectors of S&P 500 are not doing well. Utilities (XLU), Health Care (XLV) and Consumer Staples (XLP) have underperformed SPY since July of 2016 (Chart 3). Health Care started to underperform in July 2015. Real Estate sector (XLRE) is also not doing as well as SPY. Financials (XLF) is doing better (Fifth panel Chart 3). Its ratio with SPY made an almost double bottom in July 2016 and then turned around. XLF outperformed SPY till November. It is again starting to resume the trend in February. The ratio of Health Care, XLV/SPY (Second panel Chart 3), seems to have made a double bottom in January. 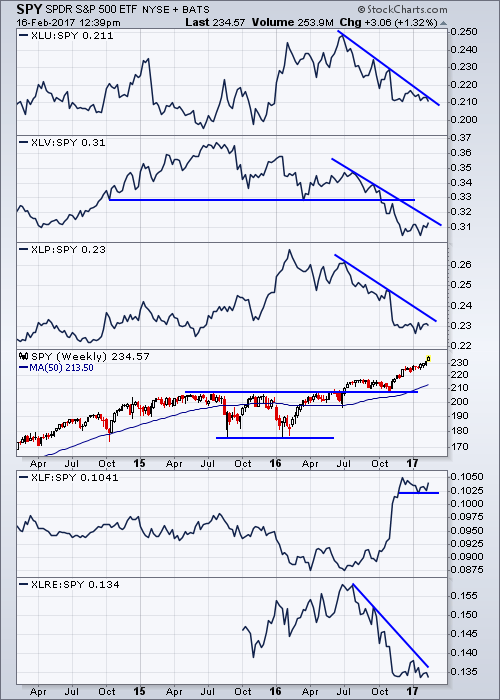 If the trend continues then it may turn around, which would mean that XLV may start to outperform SPY. Similarly, Utilities, XLU/SPY (First panel Chart 3), and Consumer Staples, XLP/SPY (Third panel Chart 3), are also making possible bottoming patterns.Real Estate, XLRE/SPY (Last panel Chart 3), is not showing any signs of reversing the rend of underperformance in the near future. Technology, XLK, is, mostly, outperforming the broader ETF since June 2013 (second panel Chart 4). It briefly underperformed SPY in Q2 and early Q4 of 2016 but resumed the trend in November 2016. 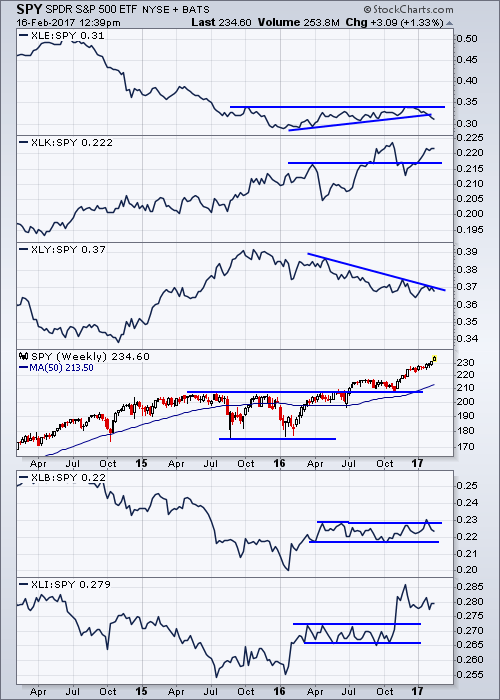 Consumer Discretionary, XLY (Third panel Chart 4), has outperformed SPY for most of the time since March 2009. Twice it underperformed SPY for many months. First occurrence was in 2014 and second is continuing since October 2016. Energy, XLE (first panel Chart 4) performed better than SPY from February 2016 to November 2016. Materials, XLB (Fifth panel Chart 4) has been matching the result of SPY since April 2016. It ratio, XLB/SPY, tried to break out of a horizontal channel in January but it appears that it has resumed its sideways movement. Industrials, XLI (Last panel Chart 4) also matched SPY for many months in 2016 beginning in April. But unlike XLB’s ratio, XLI/SPY broke out of the horizontal channel in November. 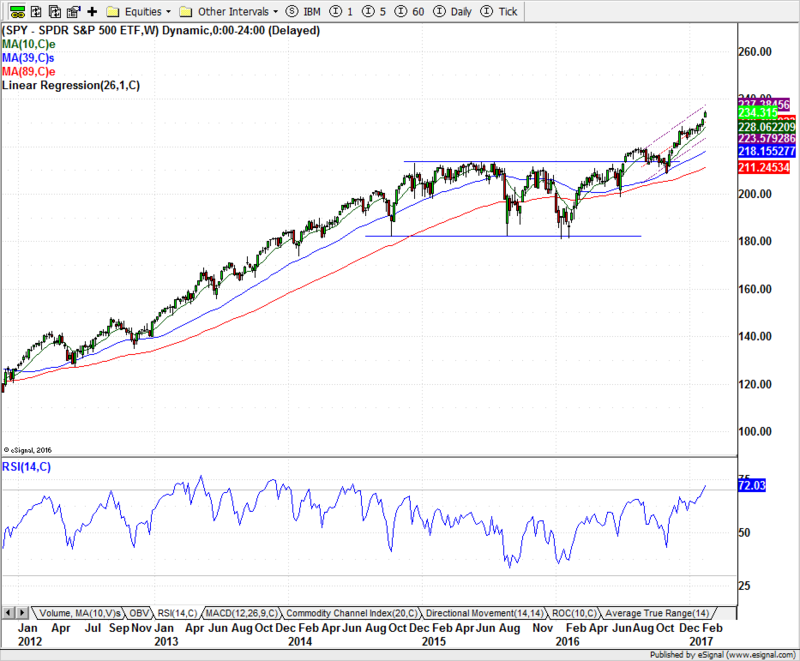 It has pulled back since December but the momentum seems to be to the upside.